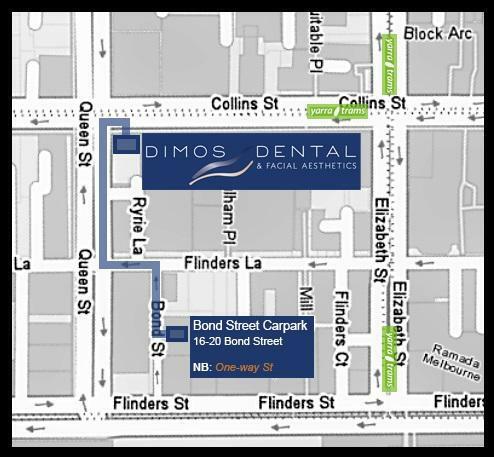 Dimos Dental & Facial Aesthetics is now located on the corner of Collins Street & Queen Street in the Melbourne CBD. Parking in the CBD can be tricky! To help our patients get safely to us, we have organised a subsidised $20 car parking special with Bond Street Car Park, located at 16-20 Bond Street, Melbourne VIC 3000, only a short 4-minute walk to our practice. The capped parking fee of $20 is to be paid for at the Dimos Dental reception desk at the end of your dental appointment and in turn you will receive a validated parking ticket. Please note: This offer is not associated with any other car parking facilities. Alternatively, there are a variety of metered street parks near to the practice, however please keep in mind the duration of your dental appointment(s) when selecting a park. Our building has an Accessibility Lift installed immediately beside the front staircase, on Collins Street. It has a simple push button design, however, if you have any concerns working the lift or if you require any assistance, please don't hesitate to call our Reception and a staff member will be down swiftly! The closest train station to Dimos Dental is Flinders Street Station, which is an 8 minute walk. Please note: There is NO Queen Street tram stop on Collins Street, see below for nearby tram stops. If you require a Taxi at the end of your visit, please inform our reception staff at check out and we will be happy to make this call for you. For further Taxi information Visit 13Cabs Website, or call 13 2227.